Pioneers in the industry, we offer cantilever racking system, light duty storage racks, medium duty shelving systems, multi tier racking system and drive - in racking systems from India. Cantilever racking is specially designed to store long or varying length items, such as metal beams, pipes, moulding, wooden boards, metal and plastic sheets among other materials. The system basically consists of columns with a vertical beam and one or two horizontal beams at the base to provide stability. A series of arms is attached on which the load is placed. Loads may be handled manually when they are light weight, or by using lift-trucks or other appropriate lifting systems when heavy items are involved. Empowered by our in-depth experience and dexterous workmanship, we have acquired our customer’s appreciation for offering Light Duty Racks. These light duty racks are high on demand in the market due to its advance quality & high sustainability. Offered light duty racks are obtainable in wide-ranging specifications as per the needs of customers. Our light duty racks are well checked from our side so as to dispatch a defect free range to customers. 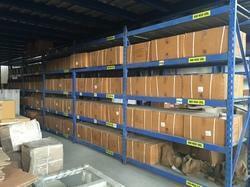 Warehouse and order picking are constantly challenged by the extensive variety of products available. Long span racking systems from Horvert Inc., are perfect for optimizing your individual storage requirements and will crate maximum storage capacity with minimum space. Especially suitable where they heavy load bearing capacity of a pallet racking system is not required. We manufacture the Two Tier Racks , which are unique in their designs and are widely used by industries and ware houses, where there is an acute shortage of space and vertical space is open to storage. The racking systems starts from the ground floor and it is divided into 1st and 2nd floors by catwalks or staircases. 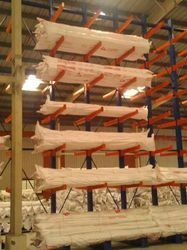 The materials could be lifted manually or by using a conveyor or forklift and one can store three fold materials by installing these storage systems. They are made according to customer specifications and at competitive prices. Drive-In Drive Through systems provides maximum storage capacity using the minimum amount of space. It is particularly suited to store very large quantities of homogeneous products. 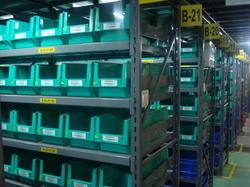 Drive-In or double access system consist of continuous lanes of racking with only a single load and retrieval aisle. Loading and unloading is undertaken by means of counterbalance or reach trucks that drive down each lane in to the racks. 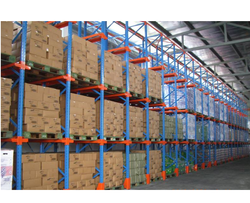 drive-In racks operates on the basis First-in Last-Out(FILO), therefore it only sits product, which is stored in sufficient volume to require multiple lanes to ensure stock rotation.